It's that time of year again. 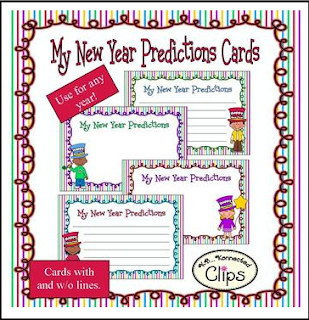 Students will have fun predicting what the new year will bring using these bright and cheery cards. They can write their predictions or draw pictures. Both options included. These will look sharp displayed in your classroom and kids will have a ball seeing which ones come true. 3 versions included of each (kid) design. Print just the ones you need! 13 pages in all. Clip art by me!